1823 - founded by George Stephenson with his son Robert, and Edward Pease and Michael Longridge specifically to build railway engines. 1828 - introduced the Experiment with inclined cylinders, which improved stability, and meant that it could be mounted on springs. 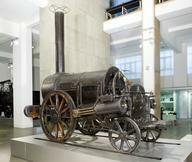 1829 - Stephenson's Rocket won the Rainhill Trials. 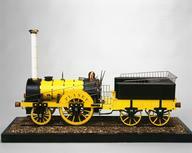 1830 - eight locomotives were supplied for the opening of the Liverpool and Manchester Railway. 1859 - Robert Stephenson died. 1877 - supplied tandem compound rotative engine for Whitwick Colliery. 1888 - Light Locomotive produced for Ireland. 1899 - the company was registered to take over the business of engineers and shipbuilders of a company of the same name.